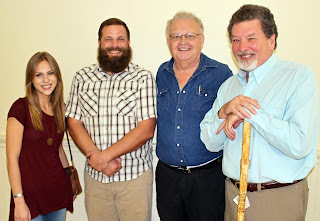 Sunday’s annual meeting of the San Marcos Greenbelt Alliance at the Dunbar Center included the introduction of four new board members: Sherwood Bishop, Anna Huff, Phillip Quast and Paul Murray. The new board met the next day, March 7, and elected officers: Mark Taylor, President; Bill Adams, Vice-president; Sherwood Bishop, Treasurer and Lance Jones, Secretary. Standing committees and their members include: Stewardship; Todd Derkacz and the trail crew; Outreach: Lance Jones, Charlotte Wattigny, Melissa Nicewarner Daly, Anna Huff and Stephanie Bryant; Conservation: Mark Taylor, Philip Quast and Fundraising: Sherwood Bishop. The San Marcos Greenbelt Alliance needs more than trail work volunteers. Members can assist by serving on one of the committees and influence the direction the organization takes in the coming years as San Marcos grows.